This class picks up where Expert Level 12 left off. We will focus primarily on Update Queries. We will begin by learning how to edit the code in an embedded button macro to control what records are printed when we open a report. 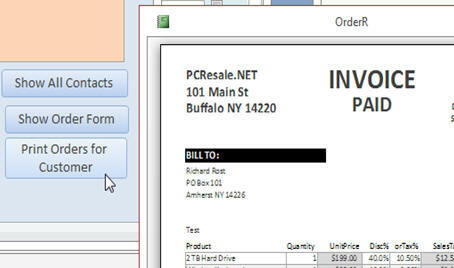 We will show a single invoice, all invoices for a specific customer, or all invoices between two dates. Next we will learn about Action Queries: what they are, what they do, and why you want to use them. We'll discuss update, append, delete, and make-table queries. We'll talk about properly backing up your database BEFORE running any action queries. Next we'll begin learning about Update Queries. We'll see how to change the name of all companies in a particular state. We'll use a nested IIF function to assign sales reps to customers based on what state the customer is in. A lot of using Update Queries has to do with fixing data that your users enter poorly. We will learn how to capitalize all of the states in our table, assuming some are entered like "ny" and other "NY" and others yet "Ny" (hey, it happens). We'll learn about the UCase, LCase, and StrConv functions to set the names of our customers in Proper Case. 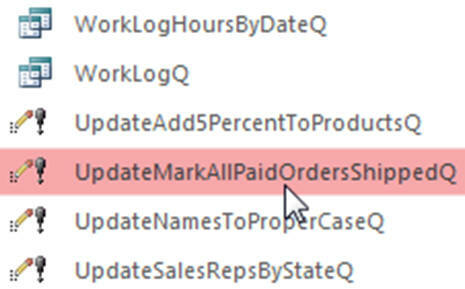 Finally we will learn how to use Update Queries to add 5% to all of our product prices, and how to mark all of the PAID orders in our system as SHIPPED, and give them a ship date. This is the 13th class in the Access Expert series. There's a lot of great material in this class. Learning Update Queries will add tremendous power to your databases. Of course, if you have any questions about whether or not this class is for you, please contact me. Change "XYZ Corp" in "PA"
Richard on 9/10/2013: Microsoft Access Expert Level 13 is 1 hour, 22 minutes long. 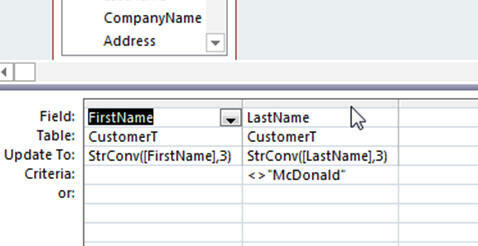 This tutorial will focus on using Update Queries to manipulate data in your tables. Topics include: - Update Queries - Types of Action Queries - Report Where Conditions - Datasheet View vs Run Query - UCase, LCase, Proper Case - Deleting Tables with Relationships - Assign Sales Rep by State - Add 5% to all Product Prices - Update Paid Orders with Ship Date Click here for more information on Access Expert Level 13, including a course outline, sample videos, and more. 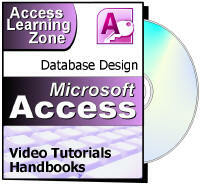 This course was recorded using Access 2013, but is also valid for Access 2007 and 2010 users. This class follows Expert Level 12. The next class in the series is Access Expert Level 14. Thanks for another excellent lesson. My question today is a general question about invoicing procedures. At some stage an invoice should be "locked down" so it can't be accidentally altered thereby affecting your year-to-date records. I've been wondering about this for a while but can't work out how to do this. This would involve some programming. I would make an OnCurrent event which would set the AllowEdits and AllowDeletions properties of the form to NO after the invoice is a certain number of days old. I tried to correct name fields to Upper and Lower case but I got an error message: 'This action or event has been blocked by Disabled Mode" Do you know why that is happening? Not sure what you mean. Could you give me more details, please? You could ignore my question. As it turns out the database I was working with at the time was not in a "Trusted Location" It is fixed now. Thanks again. Your tutorials are great, by the way. I have been able to create a database for a doctor's office and is now functioning very well. ryan Chung on 7/7/2014: Just a quick question, instead of making it prompt to enter the dates how can i make it prompt a calender? where i can select the dates? If you're using a parameter query, you have no choice but to type in dates. If you're getting the values from a FORM then you can use the date field popup calendar from a text box. vicki Hudson on 10/26/2014: at aprrox 26:12 after the build event I get an Enter parameter value, Forms!OrderF!OrderID. Why should I have a form open at this point? I can click "OK" and it prompts for BeginDate and EndDate like it should. Just not sure about the Forms parameter value. Is your OrderF Form closed? Bruce Reynolds on 11/24/2014: Can you use the Choose function instead of the IIf function? Is there a Choose function in Access? Yes there is and yes you can. The CHOOSE function is covered in Access Expert 25. Kenny Nelson on 12/30/2014: At 3:15, you are restoring your saved copy of the CustomerT. To avoid the relationship issue, can you copy the Copy Of CustomerT2 back to the CustomerT? I was afraid if I deleted the CustomerT it would affect my queries that used that table. Do you mean rename or copy the data from one to another as that would cause the AutoNumbers to change? Chris Thompson on 1/29/2015: Just a point of clarification. At 18:41 you say that "...the focus of the advanced classes is going to be on Macro design; but there are some things at are so much easier to do if I can just teach you a little bit macro editing...". Is that what you meant to say or should it have been "VBA design" and "macro editing"? More than likely, probably a bit of word salad. Bonnie Staib on 2/3/2015: In Access 2013 Expert 13, just as lesson one is ending (at 26:12) Richard tests his browse between dates button. The prompt comes up immediately. My macro will only work if I remove the refresh record action in the macro. (Message: The Command or action "Refresh' isn't available now. ")Once I remove the RefreshRecord action, it works fine. Yet, it looks like Richard did not have to remove this. Why would he be able to leave it in? Did anyone else have this problem? Try repeating the lesson again, there might be something missed. At 17:09 you say "Order2Q", but you go on to open OrderQ and modify that Query. Just a slight slip of the tongue. John Terhorst on 3/2/2016: Thank you for the effort you put into these videos! I have been enjoying following along while I am building my birdwatching database.